The hottest day of the summer so far was drawing to a close an a drowsy silence lay over the large, square houses of Privet Drive. "Harry Potter is due to start his fifth year at Hogwarts School of Witchcraft and Wizardry. His best friends Ron and Hermione have been very secretive all summer and he is desperate to get back to school and find out what has been going on. 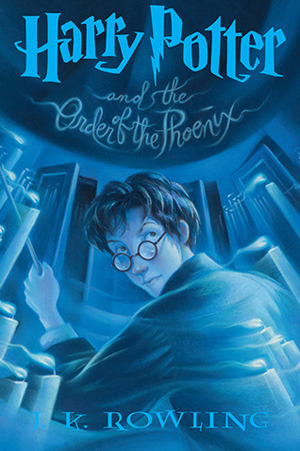 However, what Harry discovers is far more devastating than he could ever have expected..."
Harry Potter and the Order of the Phoenix is definitely one of my favorites in this series, although it is one of the most depressing of the books. It's also the longest, and perhaps drags a bit in certain places, but it's compensated by some really action-packed sequences, great character development, an excellent plot, and some new aspects to the novel. Can we talk about Dolores Umbridge? I seriously hate that woman; she's one of the most evil characters in the book, and that includes Lord Voldemort. Not the most evil perhaps, but close to it, and certainly the nastiest non-Death Eater. Still, as a villain she's wonderful, and the scenes with Harry and Umbridge are some of the most infuriating. She's also the new High Inquisitor, sent by the Ministry to take control of Hogwarts, and 'tis awful. But we all know Dumbledore will triumph in the end. Some of the scenes with Umbridge and McGonagall facing off are just brilliant, and amusing to read. As one might expect, there are many sub-plots in this large book, from Cho Chang to the DA (which I love, by the way), to Occlumency lessons and many revelations. Harry and his friends discover the Room of Requirement, and use it for Dumbledore's Army, where they practice defense spells because Umbridge isn't teaching them anything. This is one of my favorite parts of the book, for sure, even if it does end somewhat disastrously. Fed up with Umbridge, Fred and George also get up to some interesting stuff, setting off their marvelous creations. There are many hilarious moments in this book, as well as serious ones, and that's one of the reasons I really like it. At times I was outwardly chuckling; there were other scenes that were so, so sad. It's a good balance, though certainly the later books are much darker with the earlier ones, what with Voldemort's rise and Harry being in the throes of tortured adolescence. The latter can be rather humorous, but obviously not the former. There are so many different parts to this book in particular, and they're certainly woven together superbly. Each chapter brings new delights (and horrors). I'm also very fond of the next book, The Half Blood Prince.